On Thursday the FCC voted to put it right. The decision vindicates a decades-long campaign to limit the rates that families pay to talk to loved ones in prison. Families routinely pay over a dollar per minute to talk by telephone with family members in prison. The New York Times profiled Heather Kofalt, who pays $12.95 for a 15-minute phone call with her husband, Anthony (who shoplifted 21 boxes of Crest Whitestrips and is held in prison several hours away). The leading company, Global Tel*Link, charges 89 cents per minute plus a $4.95 connection fee for total of $18.30 for a standard 15-minute call, according to the Prison Policy Initiative. But it’s not about justice or money. It’s about people. Twelve-year-old Kevin told the FCC about talking to his father for five minutes at a time, his share of the family’s 15 minute, $16 phone call. Ulandis Forte discovered later that his grandmother, Martha Wright, had been spending money on phone calls with him instead of medication for herself. The Campaign for Prison Phone Justice helped organize the families of the 2.7 million children who have a parent in prison. The new rule is good for everyone, of course. People in custody who maintain family ties are more likely to succeed upon release. Why do prison phone calls cost so much? Are operations in prisons inherently expensive? Does security cost extra? Sure, but that’s not what drives the prices up. In the federal system, direct calls cost between 6 and 21 cents per minute. 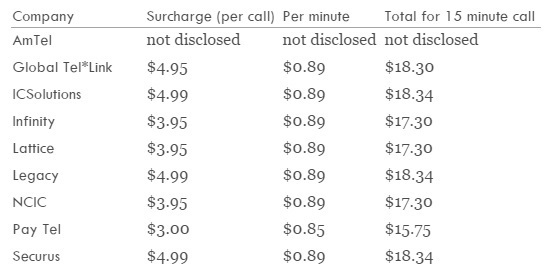 In New York State, calls cost not quite a nickel (0.048 cents) per minute with no set-up fee, so a 15-minute call costs the family 72 cents. What drives the prices up is legalized extortion, plain and simple. Telecommunications carriers charge so much because they can get away with it. The families have no choice. They can use the institutional system or not call at all. They cannot mail pre-paid cards, use dial-around services like 1-800-CALL-ATT, or change carriers. They must accept collect calls at the institutional rate or there’s no phone. That’s it. Obviously the carriers are making out like bandits but so are the prisons and jails. The telecom carriers pay commissions to the institution in the range of 65 percent. So of that 15-minute phone call that costs $18.30, roughly 75 cents covers the actual cost, roughly $11.41 goes to the city, county or state that runs the facility, and roughly $6.14 are profits for the carrier. The non-profit Prison Policy Initiative documents these kickbacks in a report, “Please Deposit All of Your Money” (full disclosure: I’m president of the board). The telecom kickbacks are in the spirit of Ferguson, Mo., which was caught arresting people and issuing warrants just to generate revenues off the fees. People with no money and at the bottom of most every measure are being charged for their own destruction. The new FCC rules set maximum rates of 11 cents per minute in state prisons, and 14 to 22 cents in local jails. It discourages kickback commissions but does not ban them (New York does) and reduces ancillary charges. The FCC rule leaves room for states to customize or improve, but is a spectacular improvement over the current dismal state of affairs. Literally millions of people will benefit; literally billions of dollars will be put to better use. This is an example of our government taking the side of the people against an industry (that has threatened to sue). Fifteen years ago I represented Martha Wright in her groundbreaking lawsuit against the industry. We brought the case on antitrust grounds, alleging restraint of trade, since Ms. Wright, the bill payer, was legally barred from choosing a lower-cost carrier. We lost the antitrust claim and the case was remanded to the FCC. It took a while … but you know how it ends.